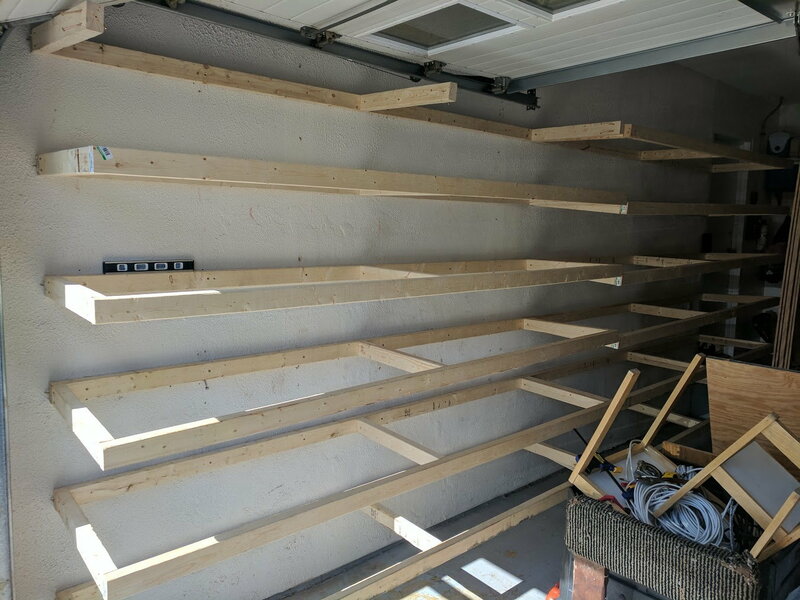 Ideas for building shelves in garage? 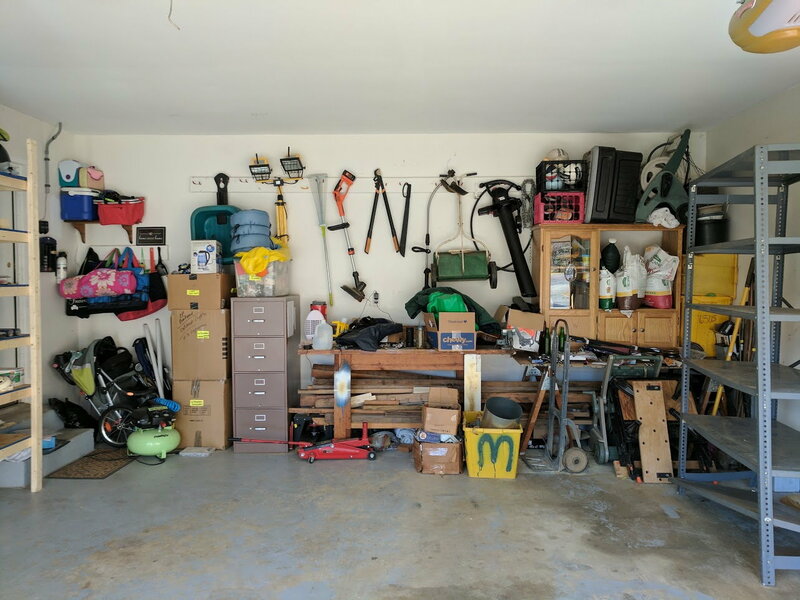 Hey everyone, I'm going to be building some shelves in my garage tomorrow and wanted to see if you all had some ideas to do it better before I get started. I can put something together just fine if I have a design, but coming up with the design is not my strong point. Basic plan right now is to clear this 16" stretch of wall and put in shelves along the whole length about 2' deep and with 1-1.5' between each shelf. 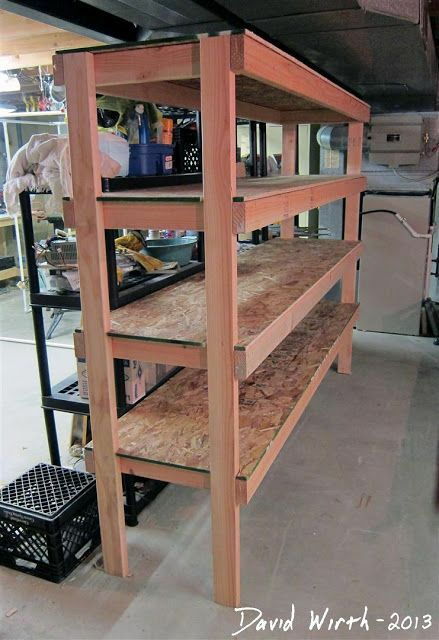 Would have a 2x4 framework with 3/4" plywood for the shelves. 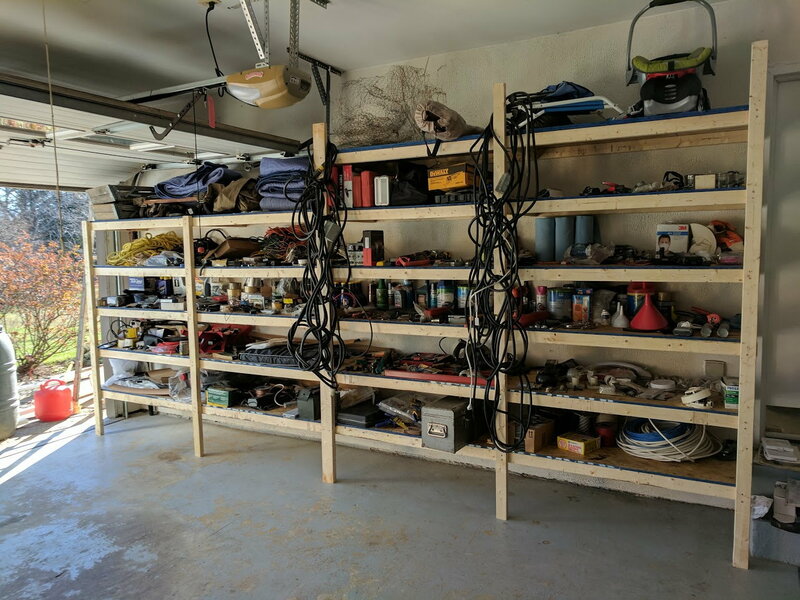 Here's a rough example of what I'm thinking of right now, although with less height between the shelves, the length fit to my space, and the rear fastened to the wall behind it. Last edited by Hatsuwr; 02-28-2017 at 10:43 PM. 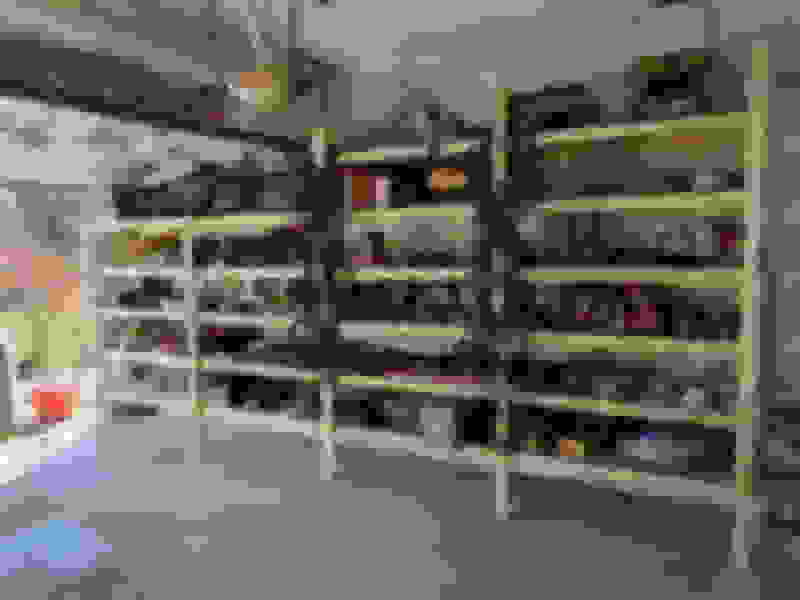 Just buy a couple more steel shelves like the one pictured and adjust the shelves to desired height. Use a couple of toggle bolts to hold them to the wall. Only reason I have that one is because it came with the house. Those things are expensive. Picked up some materials today, ~$150 in OSB, 2x3s, and some leftover 2x4s. Hopefully will be finished tomorrow! I wish I had a picture, but where I used to live, there were some nice looking shelves out of dimensional lumber. There were two sets of shelves spanning a bit over 8' each. They had three shelves on each set, two legs at each end, of each set. Being attached on the short end made for no unusable space. Someone had ripped three 8' plywood sheets in 1/2 lengthwise, fastened two 2X3's underneath the long edge on each, and filled in with a shorter piece at each short end. Basic inverted box shape. 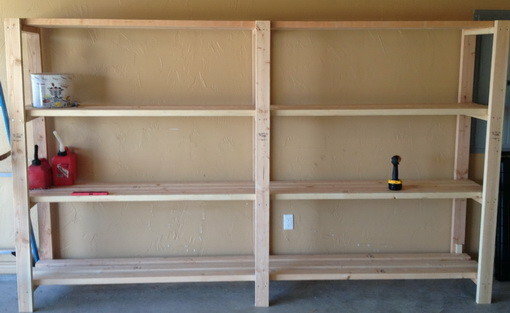 Each shelf was braced by the 2X3 frame under it, so the frame under the short end provided a place to screw into. But bolts would've made it so it could've been disassembled. They attached two 2X3's vertically to each end, against the short side of the shelf. No vertical brace in the middle. Because each shelf had a 2X3 box under it. Simple, strong, stable. They looked good. Kept bumpers, tools, ammo, hardware, and a weight set on them at one point. They never sagged, or went out of square. Suggest crowning the boards. So any curve frowns instead of smiles. I'd round off the ends of the uprights a little where they hit the floor. Keep it from splintering when it's moved. Price wise, I don't know. 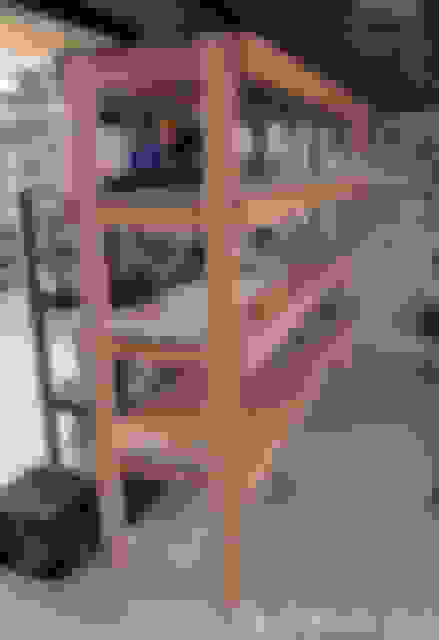 Here is a photo of a similar set of shelves. Like this, except the shelves didn't project beyond the uprights. Last edited by '00 XJ; 03-03-2017 at 07:58 PM. Nice, thanks for that. I have everything done except the uprights. It hopefully won't be moving around too much, but I might round them just to survive the inevitable kicks a little better. I was planning on having 2x3s for the outer end and middle of each 8' half, and then a 2x4 to support both halves where they meet. I like the corner supports on the narrow ends... Might have to readjust a little to allow for that, and maybe hold off on the middle 2x3s and see if they are really necessary. Those are just beautiful. Well done. Thanks! A few small details didn't work out quite as planned, and I haven't figured out yet if I want to add one more shelf on top of the right side. Will probably just leave it as is and trim the supports, but other than that, it is done for now. I went ahead and put all of the uprights on the front face, since the central three would have had to be there anyway. Also didn't really notice the blue sealant on the edges of the OSB until after I got it. Just going to go ahead and pretend that's a design feature. I was going to say something, but I noticed you caught it. 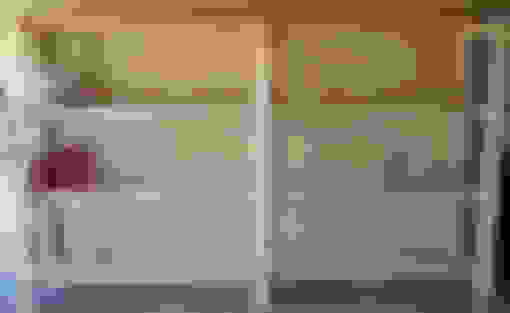 That one top shelf would be useless and might interfere with the door. Do you still have room for the car or don't you care? Haha ya... When I was visualizing this in my head, I thought I had a bit over a foot between the garage door rail and the wall. I figured a shelf there might come in useful for larger narrow things. 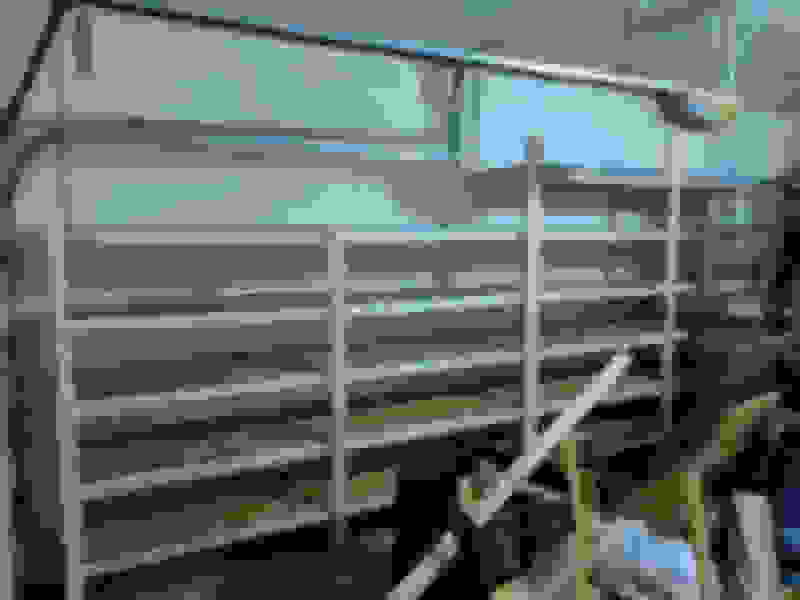 Somehow I never actually looked at that part before putting that rail up. It's a two-car garage, and we have the ZJ and a Cavalier. Both can fit, but just barely. We're selling the Cavalier though, and I'll be getting a motorcycle for most of my commuting, so it should work out. I have no idea where I put all this stuff before I had the shelves... Once I organize all of it, this wall is next. Any ideas? I figure I will expand the work bench area and add lighting to it, remove the hanging tools, put pegboard on the wall, add a sink/cleaning area, sound system... maybe get a plant haha. I have a neat trick I'd like to pass on. 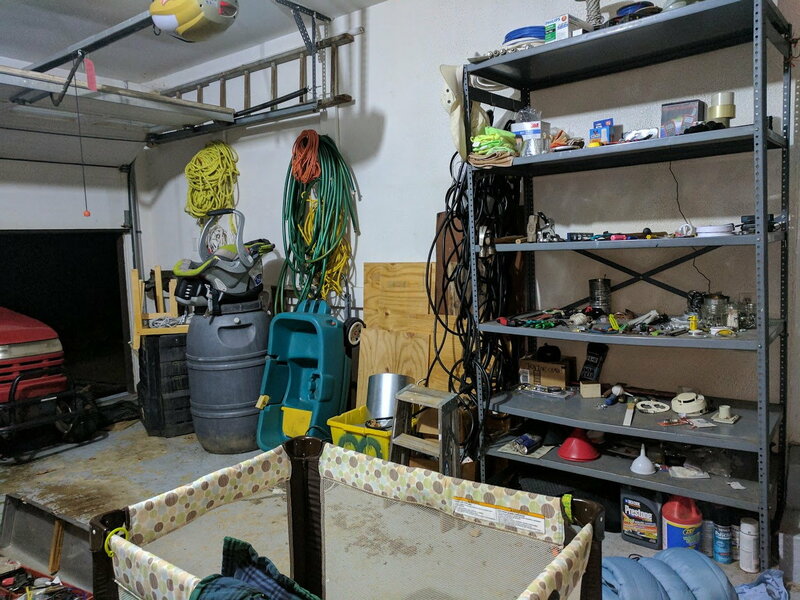 My Dad used to have a problem parking his Suburban in his garage at the proper depth so he wouldn't run over stuff and could walk around it. He got it exactly where he wanted it, then hung a tennis ball on a string from the ceiling so it just touched the windshield when it was in the right spot. I thought that was clever! Especially when my mother drove it, LOL! very popular nowadays hahah I see it everywhere! Who ever thought about it is very clever. IDK, but my Dad did it in 1975! I've actually seen it in a movie recently!